This mural was commissioned to lend depth and interest to a blank wall in an entrance hall. The restricted viewing points enabled a trompe l'oeil design option of some depth. 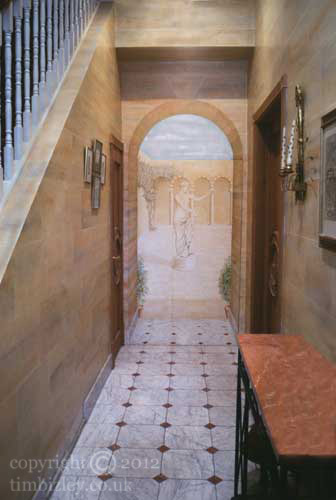 The effect is further enhanced by incorporating the faux stone effect of the walls and the marble floor into the picture plane of the mural itself. The muralist is often briefed to open up walls which are too enclosing or dominating, a situation that is often successfully remedied with a mural painting. 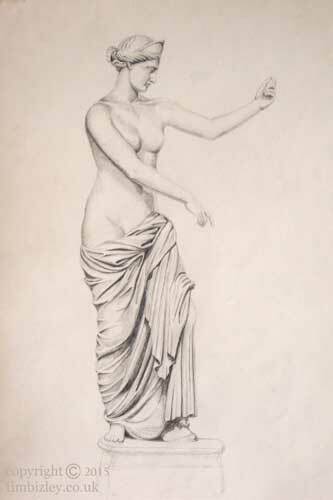 Preparatory sketches are undertaken for client approval and also to establish tonality and work out any difficult areas in pencil before working on the wall.